Writer/director Quentin Tarantino’s The Hateful Eight comes hard on the heels of the boffo box office performance of his last two features: 2009’s World War II-era Inglorious Basterds and 2012’s Django Unchained, set in the antebellum South. Nothing succeeds like success – especially in La-La-Land, where money doesn’t just talk, it shouts. There is a hallowed Hollywood tradition that allows filmmakers on a winning streak to be given carte blanche on a project, in terms of not only subject matter, but occasionally these rarified talents have bestowed upon them by the studio powers that be the elusive (gasp!) final cut. And so it seems to be with The Hateful Eight. The movie is quintessential Quentin, with plenty of witty, edgy, trenchant dialogue and lots of bloody violence flashily helmed and cut. But with cost apparently being no object and the Weinstein Company picking up the tab, Tarantino is unchained. Unrestrained by budgetary constraints, Tarantino has unleashed an almost three hour movie, complete with an overture and intermission, to be rolled out in old fashioned roadshow style. Even more, riding on a wave of box office hits, the auteur got a nostalgic notion into his noggin and prevailed upon those footing the bills to have Hateful shot in 70 mm in the same motion picture process usually used to shoot larger-than-life epics such as 1962’s Lawrence of Arabia. Indeed, Tarantino says that Hateful was shot with literally the same exact lenses that haven’t been used since Khartoum – that 1966 big screen big battle pic starring Charlton Heston and Sir Laurence Olivier (as a zealous Muslim nationalist) – was shot, in part, at Egypt in the Ultra Panavision 70 process. The similarly overzealous Tarantino conned – uh, I mean, prevailed upon – the Weinstein Company to buy up, retrofit and outfit 100 U.S. and Canadian cinemas with 70 mm projectors. Much has been made of this, with Tarantino babbling to the press about how he is reviving the 70 mm movie and roadshows. But what has he actually done with this technique in his Western? While most 70 mm productions were set and shot in the great out of doors – 1958’s South Pacific was gloriously lensed on location in Kauai, with aerial shots of Fiji; 1956’s Around the World in Eighty Days was filmed at numerous actual locations, including Bangladesh, Japan, Hong Kong, Thailand and Spain – where does Quentin’s camera do its 70 mm thang? It’s true there are a few grand exterior scenes in this Wild West flick but, rather head scratchingly, most of the 70 mm footage quite capriciously doesn’t take advantage of Colorado’s spectacular scenery. Indeed, about 80 percent or more of this movie was shot inside of large log cabin type of building (or set). At a private screening Tarantino said that this interior use of 70 mm was intended to bestow a sense of “intimacy” on the eight-plus characters who are facing off – but claustrophobia is more like it. What a wasted opportunity! While there are some outdoor scenes that reveal and revel in Western grandeur, they are few and far between (and mostly in the portion prior to the intermission). The film completely squanders the big screen process that helped make, for instance, the chariot race in 1959’s Ben-Hur such an eye-popping spectacle. Like much of Hateful’s blabbering this 70 mm ballyhooing is much ado about nothing. And speaking of Part I of Hateful: It is mostly a two-hour or so blabfest (as if you need a big screen process in order to enhance dialogue – which when not lensed in the confines of a cabin often take place inside of an even more cramped stagecoach!). There is also dialogue than can be interpreted as anti-Latino and homophobic. Act II is full of the murder and mayhem delivered with cinematic panache and punch, which is one of Tarantino’s trademarks. The other is the writer/director’s dialogue, which is often witty and sounds like lines written by somebody with his ear sharply tuned to how people talk and what they talk about in real life. I still recall the opening dialogue of hoods sitting inside of a restaurant discussing the efficacy of tipping – how much, whether to or not to – in the opening of 1992’s Reservoir Dogs, while 1997’s Jackie Brown likewise has excellent dialogue. Christoph Waltz’s harrowing words in the lengthy beginning of Inglourious Basterds are likewise “glourious” and helped score that Austrian thespian his Best Supporting Actor Oscar. I’ve always enjoyed Tarantino’s dialogue but deplored his ultra-violence, as well as his abusive treatment of women in his movies (with Pam Grier in Jackie Brown being a notable – and welcome – exception to this sadistic rule). As the prisoner Daisy Domergue, Jennifer Jason Leigh (the latest thespian Quentin has rescued from obscurity, as he did John Travolta with 1994’s Pulp Fiction) and all of the other ladies in Hateful are abominably abused – and the mistreatment mightily meted out to Leigh is meant to be knee slappers. Because his flicks have been so blood-soaked I’ve avoided many, although I enjoyed Basterds and Django, wherein he cleverly made his bloodthirsty bent “socially acceptable” by making the objects of the violence Nazis and slave masters. I mean, would even the most adamant pacifist really complain at Hitler and his entourage being burned to cinders in a movie theater? Having said all of the above, what bestows a socially redeeming value on Hateful and makes it worth seeing for more politically aware members of the audience is that much of its yakking is about racism. Although the film is set in the post-Civil War era in the West, one strongly suspects that Quentin is also referring to contemporary America. “I am a human being with a conscience, and when I see murder, I cannot stand by, and I have to call the murdered the murdered, and I have to call the murderers the murderers.” Although much – and inaccurately – paraphrased, that’s what he said onstage and it got the cops and their sycophants in a blithering dither. Well, good on you Mr. Tarantino. I applaud you and am rather pleasantly surprised that a purveyor of willy-nilly – albeit artful – screen violence, which I suspect contributes to America’s violent gun culture, actually does think he has a conscience and daringly took a public stand on this pressing issue. Welcome to the light side of the force, Quentin! We toss fragrant laurels upon thy brow and give thee hardy handshakes. The firestorm this short statement set off is a curious barometer regarding where free speech currently stands in the land of the free. 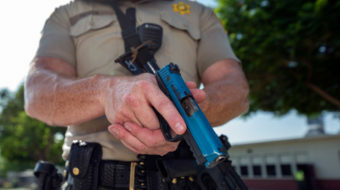 Cops guilty of widespread brutal repression can’t stand to be verbally criticized, so desperate to be “respected” and feared that they don badges and uniforms! Woe is thee – but not for Michael “Hands Up! Don’t Shoot!” Brown, Laquan “16 Shots!” McDonald, Eric “Can’t Breathe!” Garner, et al, and their loved ones! While Tarantino strangely squanders 70 mm’s big screen promise by limiting most of his mise-en-scene to the confines of cabin or stagecoach interiors, depicts onscreen violence and brutality against women, besides diehard Tarantino fans, The Hateful Eight is worth seeing by socially conscious viewers because of its scorching onscreen examination of racism – then and now. There is also some good music that is good, bad and ugly by the one and only Ennio Morricone, plus worthwhile acting. 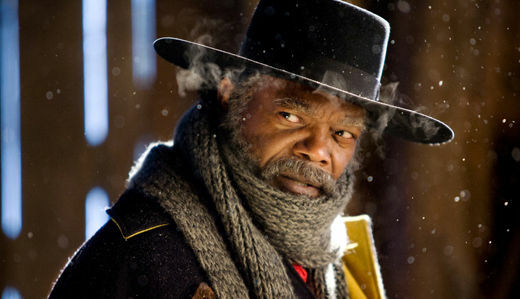 It’s refreshing to see that Tarantino alum, Samuel L. Jackson actually return to acting per se in The Hateful Eight, which opens Dec. 25 in L.A. and N.Y. (but not at the Cinerama Dome, which is screening the latest Star Wars sequel – much to Tarantino’s noisy consternation) and goes wide Dec. 31 . L.A.-based reviewer/film historian Ed Rampell appears in an episode of the Asylum Entertainment series “Demons in the City of Angels,” about blacklisted screenwriter Bobby Lees, expected to air Jan. 9, 2016 on the Reelz Network. 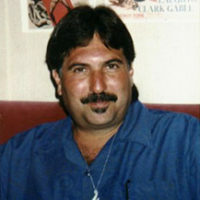 Rampell co-authored “The Hawaii Movie and Television Book” (see: http://hawaiimtvbook.weebly.com/).